The Phoenix Agents: Real Estate Pricing - has the market recovered? 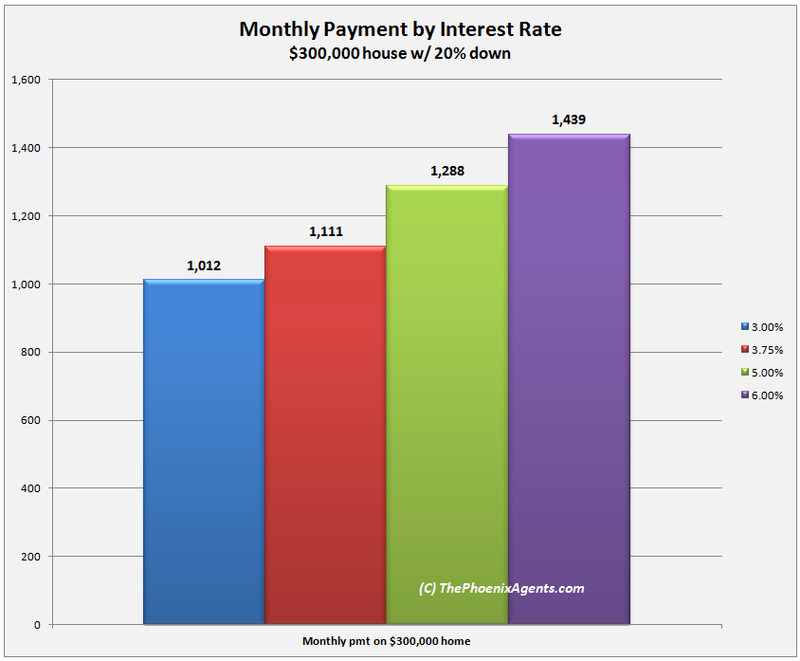 Real Estate Pricing - has the market recovered? It's been a full year since I pulled some statistics from the ARMLS database and took a detailed look at pricing trends. 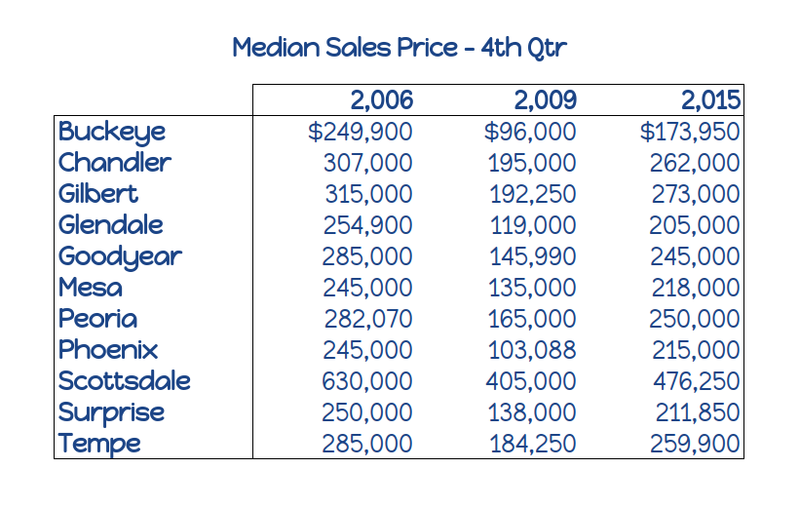 In the meantime, I've had conversations with multiple people recently centered around the price of their home as compared to what it would have sold for "at the peak". Obviously, that seems like a good place to start looking around. From Peak to Valley to Comeback? 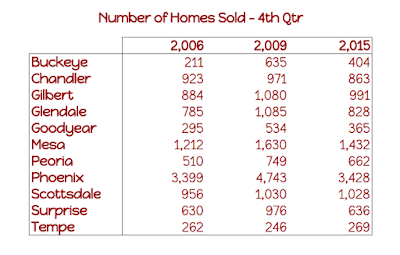 The Phoenix real estate market peaked in August, 2006, as far as the lightning fast, white hot, crazy market went. Prices, however, continued to rise for another several months. 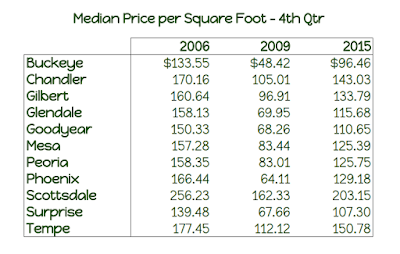 Once prices started dropping in 2007, they dropped fast and far, before bottoming out in late 2009 or early 2010. 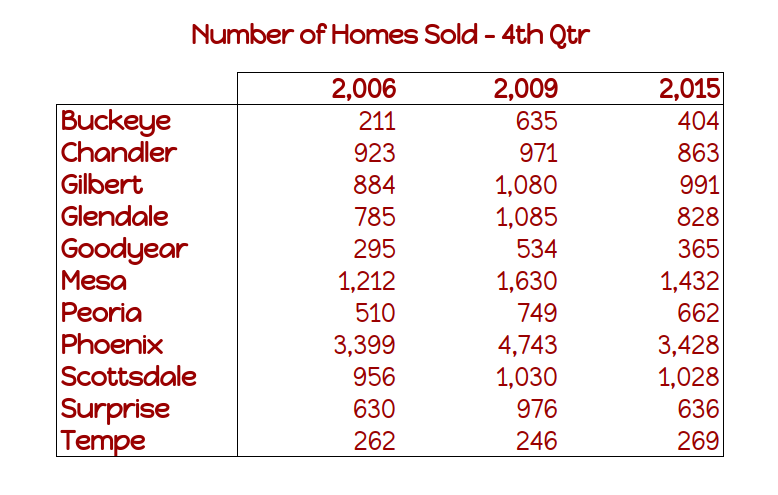 For comparison purposes, I pulled sales data from the 4th Quarter of 2006, 2009, and 2015. This should give us a good read of where we've been and where we are currently. It's clear that prices have rebounded a long way from the bottom, with a few cities' prices approaching their 2006 peak. Here's the table containing the data, for those analysts out there. Same time frames, same cities, but this time we'll look at the price per square foot, as this will adjust for changes in prices due to larger or smaller homes being built over the last 10 years. 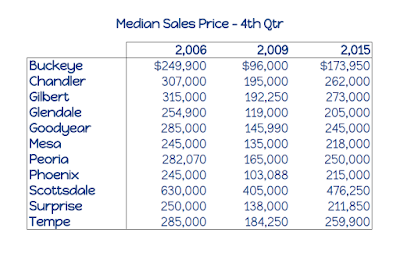 Well, the charts aren't identical to the Median Price charts - the 2015 numbers haven't rebounded quite as high as the median prices' chart. 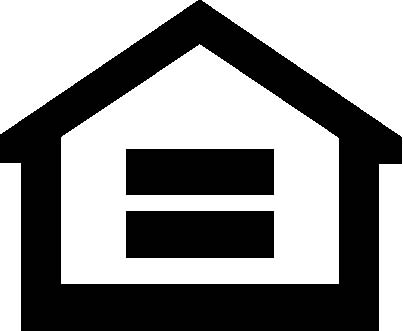 This means that homes are larger than they were in years past. But it doesn't change the trend; the peak-valley-rebound images are very similar to the previous charts. Once again we'll pull the same time periods and cities, only this time we'll put pricing aside and just look at how many homes have sold. What does this chart tell us? No, seriously, I'm asking you.. I've looked at these numbers two dozen times, and I'm not sure what they're saying, other than to point out that Phoenix is far and away the largest city in terms of housing units. Some cities are relatively flat over all three periods, while others vary wildly, but I don't see a relationship to east-west, north-south, big-small, landlocked-outskirts, socioeconomic, etc. What does all this mean? Well, that's the million dollar question. It does feel as if employment levels have stabilized. I remember a time a few years ago when a job posting on craigslist brought about a hundred resumes on the first day. These days I know a couple companies who have had a harder time finding good help. Last year I was worried about interest rates, or at least that there was so much more room for rates to increase compared with the opportunity for rate reductions. And what happened? Several countries' central banks have moved interest rates negative - banks have to actually pay interest to keep surplus money on hand! I'm not going to tell you whether to buy, or sell, or what city is "hot", or anything else you should be doing with your investment dollars. I'll simply advise to be careful. Cover your bets. Make decisions based on well-crafted plans. Don't be surprised if the market doesn't do exactly what you expected it to. * All data was pulled from the Arizona Regional MLS system, for Single Family Residence detached homes which successfully closed escrow between October 1st and December 31st of 2006, 2009, and 2015. Data is believed to be accurate but not guaranteed.